Yesterday was the scheduled date for Bacon and Fozzie’s “Shopping Around the World” feature! I’m a day late as yesterday I did my Friday Fictioneers (yes, Friday Fictioneers starts on a Wednesday). Here are the prices for the goods they have chosen for the south west of England. Water. Let’s shoot for a price on a 24 pack of water. This is something that we use every day and can’t live without. Some people drink it straight from the faucet while others of us buy bottles. What is the price of a 24 pack of water in your area and what brand? First off, it has to be sparkling water. If I want still water, I’ll get it from the tap (which apparently is what “faucet” means). I looked and looked and I can’t find any 24 packs, the most was 12. I’ll show the ones I buy – 6 x 500ml. This costs £1.50, which is US$2.49. In terms of quantity, as Bacon posted his in “ounces”, 500ml = 16.9 US fluid ounces. As a bonus, the website proudly proclaims that this water is vegetarian-safe! Who knew? Bath Soap. Something ‘most’ of us use when we shower – or I hope so anyway snorts. What brand do you get, how many boxes together and how much. I say how many boxes because I know sometimes they are sold in packages of 1 or 2 – sometimes more. To be honest, I haven’t bought a bar of soap for many many years. Maybe decades. So I’ll have to give you the price for shower gel. I buy Lynx shower gel, which is £2.40 (US$3.98) for one 250ml bottle. Currently it’s on offer for £1.20! Because, obviously, shower gel doesn’t go off, I tend to wait until it’s on offer and then buy loads. Deodorant. This is something that has blown mom’s mind lately – the price of deodorant – WOW! Again, this is something that most of us use every day or should. Tell us what brand you get and how much. Again, I buy Lynx deodorant. According to the TV adverts, all you need to do is squirt it a bit and then thousands of women come running. It hasn’t worked for me yet, but I live in hope that one day it will live up to its advertising. I’m not greedy, one woman will do. This is currently around £3.50 for a 200ml bottle (it varies a lot). Again, I wait for an offer and buy loads at once. Laundry Detergent. Another product that is important in our lives while washing our clothes. What kind do you buy, the price and size. There are lots of different types of this – colour fast, bio, non-bio… As a bloke I don’t care, as I chuck everything in together anyway. I buy Ariel “whatever”. This is the one I currently have in my cupboard (cupboard not shown). This comes to around £6.00 (US$9.94) for 20 washes. One of these boxes will last me around 4 months. I expect someone’s going to work out my “washes per week” now. Be kind. For my random item I’ve chosen half a dozen medium-sized free range “happy eggs” from the Happy Egg Co. Because nobody likes an unhappy egg. 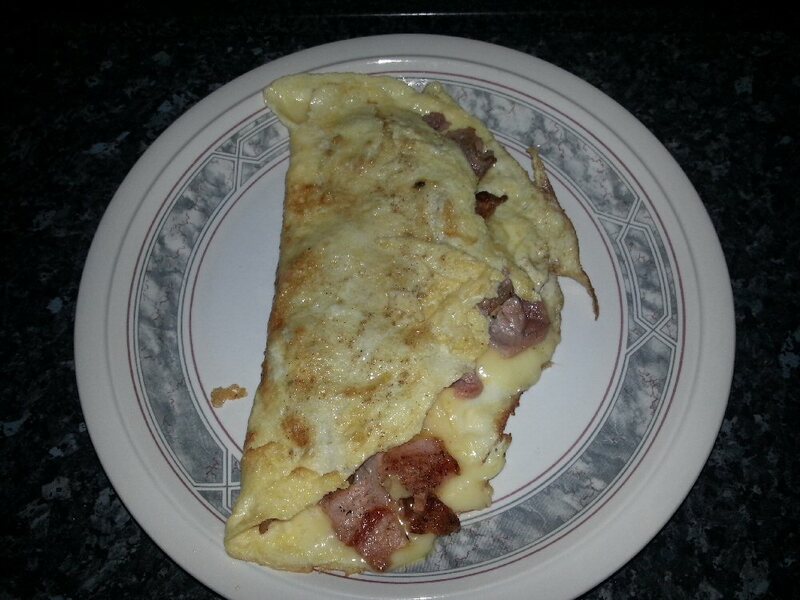 These cost £1.95 (US$3.23) and I used two last night to make this scrummy omelette, with bacon and cheese. This is the first omelette I have ever made! My boss at work gave me instructions (thanks, boss!) and although it turns out I have neither omelette pan nor mixing bowl, I made do. I was supposed to do this challenge, then I got distracted by the breaking news on Hello Kitty. Maybe i will go ahead a day late as well. Anyway, I wonder if Lynx is like Axe, or if all men’s body care commercials advertise on instant attraction. I looked up Wikipedia and it says that Lynx is called Axe in some markets, so maybe it’s the same brand. You got me beat on price this month, but many of the products are ones (cleanliness products) where I always buy brand names, which don’t come cheap! The omelette looks very professional. We have a 450 ft. deep artesian well, so we drink our own water which is way better than anything they bottle. And ice cold, right out of the tap. Of course, we have to periodically replace well pump ($2000) and other minor items … but that’s only every 10 years or so and the water does all things that water does, including bathing and washing and drinking and cooking. All you need is a REALLY deep hole and a big pump. And electricity. Thanks! I was amazed at how well it went considering it was my first one 🙂 . I was anticipating a scrambled egg-type mess (which would have been fine too!). I remember you mentioning your well a while ago – it sounds great. Of course, if I wanted one, I’d need all of that – plus the biggie, planning permission! If your neighbors have wells, you just need to talk to one of those guys that digs. They would know about permits etc. And your aquifer, how deep it is, well pumps, etc. You need a pump unless you want to bring it up by the bucketful using a crank and a rope. I think that only looks romantic. A well is a very nice thing to have. Even if you have “city” water, nice to know you have your own source. Yours would be much better tasting too. Most well water IS better — no chemicals. Last time we stayed with a friend in Arizona, the local water tasted like an old swimming pool. Ew. Wells aren’t really a “big thing” here. I guess most everywhere is so close to the water mains that people never considered it once piped water was introduced. It sounds like it tastes delicious, though. I have been wanting an omelette all day and now I know why! I must have spotted this picture on FB or my feed or something and it stuck with me. Enjoy your omelette, if you decide to make one! oh my goodness! i haven’t seen Ariel since leaving Massachusetts! I’m equally SHOCKED to see “the spanish detergent” as it was known there with English written all over the box! The boxes sold “back home” were completely covered in spanish instructions/words which is why it was known as “the spanish detergent.” I always assumed it was a wierd import! Holy cow! You comment prompted me to look it up! It’s made by the American company Procter and Gamble which was founded by two British gentlemen of the same names. 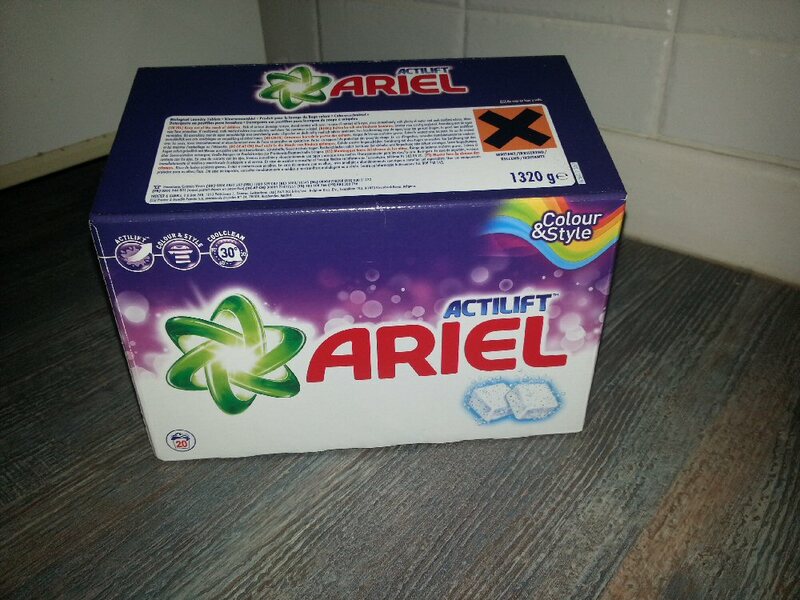 Ariel first appeared in the UK in the 60s and it does say that in some US stores you can buy “Mexican Ariel”. hahahaha “Mexican Ariel!” That is TOO funny! Seems more appropriately sold in Florida than Massachusetts where there are NO Mexicans! Crazy marketting all around! Me too. I don’t know why I never tried before, I guess getting it cooked just right looked a bit tricky. Fortunately it wasn’t! The omelette turned out good and you would never know you didn’t have a pan or mixing bowl! It was very tasty! Of course, anything containing bacon is automatically tasty. Although my frying pan is a bit big for a 2 egg omelette (I only had 2 eggs left), it wasn’t so big that it didn’t work 🙂 I might get a proper omelette pan now though! Congratulations on your omelette? What time is supper? Thanks, today an omelette, tomorrow, who knows?! Some of my clothes are quite old, I don’t think they would stand up to very much hard scrubbing! Great looking omelet and it doesn’t matter if it looks good, still tastes good. Also any leftover veggies do well in omelets. Any product you like will have tried and true recipes on the packaging, a good place to begin. Yes Arial soap is promoted as a Mexican soap here. That’s the only one I relate to and don’t use. I like liquid or pods. I’m going to buy more eggs on Monday to make another one. With a bacon and cheese omelette we’re talking cholesterol, fat and salt so I can’t have too many. I don’t tend to have leftover veggies as that implies I had veggies in the first place 🙂 Mushrooms and tomatoes would be nice, though. I’ve never tried liquid or pods but things seem to be going that way so I expect I will at some point. I used to use powder, the stuff I have at the moment is little bricks of powder. Happy International Bacon day, DrAli and all bacon lovers.